Ritual Sati: The Ultimate Sacrifice or An Extreme Deception? | Spell Hub. Brining the occult to life. Ritual Sati: The Ultimate Sacrifice or An Extreme Deception? While the sati tradition was considered a common practice of the Hindu religion on the Indian subcontinent, when the British rule began during the 19th century it created a great cause for concern for the new administration. The women who made this ultimate sacrifice were called satis, meaning “good woman” or “good wife”. The ritual was associated with the goddess named Sati of Hindu mythology, who immolates herself as an objection to her father disrespecting her husband, Shiva. This deeply ingrained act was seen as a symbol of extreme wifely devotion and beginning around the year 400 began being memorialized on inscribed stones. Though the British rulers were fervently opposed to the continuation of this unspeakable injustice to women, they were met with fierce opposition by those who insisted on preserving Indian tradition. The abolishment of “widow-burning”, as the Brits called it, was an undertaking that would be several years in the making. The Westerners who originally observed the sati felt sympathetic to the idea of widows who chose to end their own lives because they were so inconsolable over the death of their men. However, it was not long before other ideas began to arise surrounding the ancient practice. The notion was introduced that women participating in sati were believed to continue to serve their husband in the afterlife. Additionally, the action of the sati was said to recompense the sins of the husband’s family. Finding these ideas curious, Western observers began to realize the startling reality behind many sati rituals. What seemed like a selfless act of true loyalty was actually often a widow coerced by greedy family members hoping to have their sins wiped away. Also, because widows were the sole beneficiary of the husband’s wealth, her death meant the money would be redistributed to the family. It was discovered that some women were pressured into sati by use of intimidation and even drugged in some cases. It was also noted that in some sati ceremonies there were provisions, such as setting the pyre in a deep pit or using bamboo levers to hold the bodies down, that were implemented to assure that there would be no last minute escape by the frightened widow. The plight of these beautiful, exotic women captured the attention of the British public prompting newspaper reports, parliament discussions, and a collection of petitions. 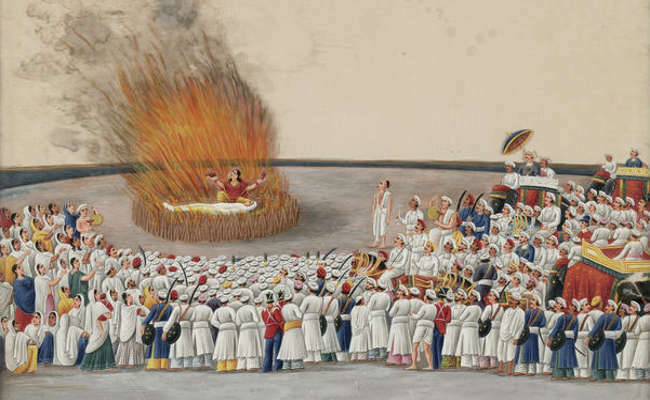 Believing that they were culturally and morally superior, the British felt that it was their responsibility to bring an end to the shocking and appalling sati practices. After both men and women raised their voices in angry protest, the first formal ban was imposed in Calcutta in 1798. A series of campaigns systematically outlawed sati in the all of the British territories by 1829, and Queen Victoria issued a ban that spanned across all of India in 1861. However, it wouldn’t be until 1988 before the Indian government developed the Sati Prevention Act and further criminalized any kind of aiding or abetting in the ritual. Today, even the glorification of sati in any form is punishable by law.